The history of Kingship Yachts, the first builder in Asia to specialize in steel and aluminum luxury yachts, is not a very long one compared to some of the more venerable yacht builders in the world market. After all, although Kingship Yachts has garnered numerous awards, the company only opened its doors just over ten years ago, in the summer of 2003. While the company is relatively new, its founder, Roger Liang, grew up immersed in the boat-building world. For Roger Liang, building boats is the family business, and he is ably carrying on the family tradition. Roger’s father built water-jet powered catamarans that revolutionized the ferry service industry in Hong Kong, and the family owned several shipyards as Roger was growing up. His own personal foray into boat building began when he and his family decided to purchase a 56-foot Baglietto in 1982. Shortly after their transaction, the shipyard fell into bankruptcy. Roger purchased the company, finishing his yacht and joining with an Italian partner to run the company for the next eight years. He gained a lot of valuable experience, learning the importance of inspiration during his years at Baglietto. Over time, Roger became intrigued by the idea of pairing that kind of inspiration with the disciplined labor force available in Hong Kong. He sold the company in 1989 and set out to create an Asia-based yacht building company that could match the quality of European builders. With the purchase of a small shipyard in Zhongshan, in the Pearl River Delta, Kingship Yachts opened its doors in 2003. Eschewing the cheap manufactures that abounded in China at the time, Roger shipped in almost all the major components for the first Kingship yacht to ensure they were of the best quality. He has spent the intervening years gathering talented workers from around the world. The initial small shipyard has expanded to a 60-acre ultra-modern facility with room to construct seven superyachts simultaneously. Although Kingship Yachts’ History is not long, it is illustrious. Kingship Yachts has produced an impressive fleet of luxurious superyachts over the past decade, and as they move into the future, Kingship Yachts is earning a solid reputation as a creator of exquisite luxury megayachts that are designed and engineered to perfection, involving only noted designers and architects as they consistently meet both universal MCA and Lloyd’s standards. Are you craving a Kingship Superyacht of your own? The experienced yacht brokers at Atlantic Yacht and Ship will work with brokers around the world to find the perfect vessel for you. We also have an extensive selection of beautiful new and pre-owned yachts for sale, including Savannah Ann, an exceptional 78′ Marlow for sale. One of the most photographed vessels in South Florida, this beautiful 2005 78′ Marlow Explorer’s Portuguese forward deck and lapstrake hull set her apart from the crowd. Savannah Ann is a one-owner charmer built for entertaining, with a covered aft deck perfect for taking in all the sights, and a saloon with an enormous U-shaped leather settee. 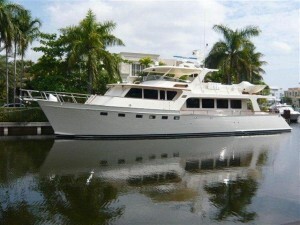 Located in Ft. Lauderdale her asking price is $2,100,000 USD. Bring your offer to Gregg Silver at 305-304-4574 or email him at boatingsilver@earthlink.net. Atlantic Yacht and Ship‘s knowledgeable South Florida yacht brokers are waiting to help get you out on the water in the vessel of your dreams. Whether you are seeking luxury yachts for sale, or are a boat or yacht owner looking to sell or trade, Atlantic Yacht & Ship has the experience and connections to help you realize your goals. Browse our extensive yacht listings of new and preowned motor yachts, or call us directly at 1-888-230-0439 and we will gladly help you locate your ideal vessel.